Though the The Whitworth in Manchester was founded in 1889, in the last few years the museum has changed dramatically. After a £15 million development, it has been given a new lease of life, and was awarded Art Fund’s Museum of the Year in 2015. The building is set in a park, and is the first museum in the country to open in such a setting. It was opened in memory of the Northern industrialist and philanthropist Sir Joseph Whitworth, who at the time of his death in 1887, left his money to the people of Manchester. This money was used in the opening of a new hospital, as well as the Whitworth gallery itself. The museum was open to “people of all social classes,” with the express interest to give “perpetual gratification of the people of Manchester”. Throughout its history, the building has been added to and adapted; in the 1960s, the gallery was refurbished to feel more open plan, and an extension was added in 1995 which became known as the ‘Sculpture Court’. In its big redevelopment in 2015, new wings were added that combine the aesthetic of contemporary architecture with the heritage of Manchester, blending glass, steel and red brick. When it was first opened, the gallery was immediately supported by prominent figures in Manchester who helped shaped the direction and ethos of the gallery. Manchester played an important role in the Industrial Revolution due its manufacturing industry, so the founders sought to have a collection reflecting this key aspect of Mancunian heritage. In 1908, when the first Whitworth was finished, the gallery had already acquired two impressive collections; one of British watercolours and drawings, and the other of world textiles. Since then, the gallery has developed a diverse collection of 60,000 artworks. As well as work by masters such as Thomas Gainsborough and J.M.W. Turner, the Whitworth also has a collection of over 5,000 wallpapers. The gallery has an amazing history of past exhibitions, with work shown by contemporary British filmmakers John Akomfrah and Ben Rivers, as well as collages by acclaimed artist John Stezaker. The gallery has also hosted more general exhibitions on a period or a movement; in 2015-16 they displayed Abstract Landscape, showing work undertaken by artists such as Gillian Ayres and Barbara Hepworth in the 50s and 60s, and in 2017-18, they highlighted the work of South Asian Modernists 1953-63. The gallery has also shown work by well-known stars of the 20th century, including Andy Warhol. Though the Whitworth does not have permeant displays, their exhibitions are often made up from their varied collection. The gallery is a part of the University of Manchester, which means that it blends public-facing art outreach with high quality research and rigorous study. The gallery boasts both a Collection Centre, where their 55,000 objects are housed, but also a Study Centre, through which researchers can make appointments to view particular objects with specific curators. 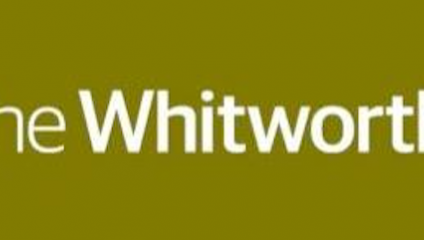 They also put on a programme of free events and talks as part of Whitworth Studies, through which the public can hear from experts and artists, and broaden their knowledge of both the collection and art itself. The Whitworth is free and open every day.